Rwanda’s Untold Story: Who Was Behind the Genocide? Early reviews and reactions on social media, indicate that the BBC documentary “Rwanda’s Untold Story” is changing the long-established “Rwanda genocide narrative” carefully crafted by the victors in the 4-year war for power in Rwanda, with assistance from U.S. and UK allies. As the U.K. Daily Telegraph’s critic Gerard O’Donovan observed in his four-out-of-five stars review: “Interviewing academics, survivors and former henchmen of Kagame, Corbin embarked on a forensic deconstruction of the official history of the genocide (which puts the blame entirely on the Hutus). Studies by two American researchers suggested that hundreds of thousands of Hutus could have been killed too, possibly by RPF forces. A UN report expressing similar concerns had allegedly been suppressed. Belgian historian Prof Filip Reyntjens suggested that Kagame could be one of the ‘most important war criminals still in office today’”. 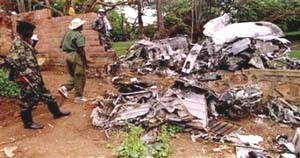 Reporter Jane Corbin and Producer John Conroy reveal, through documentary evidence and first-hand accounts, that the Clinton and Blair administrations began covering-up Rwanda President Paul Kagame’s role in the April 6, 1994 presidential assassinations of Juvenal Habyarimana and Cyprien Ntayarmira that triggered Rwanda’s Genocide, almost immediately. This U.S. and UK-sponsored impunity for Kagame’s and the RPF’s crimes in Rwanda and Congo from 1993 to the present, for “genocides in plain sight,” reported in UN and State Department documents, have cost more than 5 million lives. In Rwanda, a brutal dictatorship reigns at gunpoint. · RPF Lt. Ruyenzi, formerly of Kagame’s personal Headquarters detail now in exile, explained Kagame’s elated reactions with other military leaders on the night of the assassination, when the orders for the final assault for power were given. · The September 1994 Memo to President Bill Clinton’s Secretary of State Warren Christopher confirms the Clinton Whitehouse was informed of mass RPF crimes two months before the U.S. voted to establish the UN Tribunal for Rwanda. · Former Chief of Staff Gen. Kayumba Nyamwasa, another former Chief of Staff admitted to his role in the conspiracy to assassinate Habyarimana, as described in Indictments issued by French and Spanish Judges. · Another former Chief of Staff, Dr. Theogene Rudesingwa admitted to his role in the cover-up in a voice-over while the visual showed his meetings with President Clinton during Rudesingwa’s term as Rwandan Ambassador to the U.S. The one-hour documentary: “Rwanda’s Untold Story,” that aired on Oct. 1, 2014 is the first mainstream media telling of the narrative that was revealed in documentary evidence at the UN International Tribunal for Rwanda as early as 2007, and in public statements to the UN Security Council by Carla del Ponte in 2002 before she was removed from office. The narrative heard by the UN Tribunal, supported by UN and USG documentary evidence, describes the RPF as the military aggressor that intentionally triggered mass violence as a military strategy, using the same scenario that occurred after Burundi’s President was assassinated in October 1993 when some 200,000 Hutu peasants were massacred by the Burundian army which was Tutsi-controlled. The evidence before the UN Tribunal for Rwanda resulted in the entire military-political leadership of the defeated government of Juvenal Habyarimana being acquitted of long-term planning or conspiracy to commit genocide, or other war crimes, against civilian Tutsis prior to mass violence breaking out in reaction to the assassinations of the two presidents on April 6, 1994. The narrative of “Rwanda’s Untold Story” reflects the central facts of “the Rwanda genocide” narrative first described, in court, as the “alternative description of the mass violence that swept Rwanda” in the November 2007 Ntabakuze Defense ICTR Trial Brief. The alternative narrative resulted in the acquittals of the Military-1 defendants on all charges of “conspiracy and planning to commit genocide” in December 2008. Thiery Cruvalier, writing in The International Justice Tribune in December 2011, when the UN Appeal Chamber agreed that the supposed “architect of Rwanda’s genocide” Col. Theoneste Bagosora and his three co-defendants, committed no crimes before Habyarimana’s plane was shot down, said the Rwanda genocide was “Brainless” because there was no evidence it was planned, or the result of a conspiracy. By December 2013, the Appeal Chamber had upheld these acquittals as did the Trial Chambers in the Military-2 and Government-1 and 2 trials. This is also the point of my 2013 book, “The Accidental Genocide,” which relies on original UN and United States Government (USG) documents, to describe the “logic” of the four-years of war given the imbalance of forces created by the RPF becoming the major military power in the region between January 1991 and January 1993 while in the Virunga Mountains in Uganda. The RPF grew by ten-fold in the number of troops under arms and was transformed from a defeated conventional army of “NRA Ugandan-Rwandan deserters” to a highly effective light infantry capable of seizing power, according to Gen. Dallaire in his Reconn. Report to the UN Security Council in September 1993. This rapid transformation in two years on Ugandan territory required nation-state sponsorship. Then as now, the UK is Uganda’s largest donor and its Ministry of Defense (MOD) a major supplier. In “Rwanda’s Untold Story,” interviews with U.S. academics, Dr. Allan Stam and Dr. Christian Davenport of the U. of Michigan and former ICTR Prosecution experts shed light on the RPF government’s claims that 300,000 Tutsi remained in Rwanda after the genocide. Census and UN figures show 500,000 were present before the genocide. If, there were “1,000,000 victims” as the world has been told in the popular account, the vast majority of those killed must have been Hutus, or the size of the tragedy must have been more in keeping with the “Burundi genocide” of October 1993 in which some 200,000 to 300,000 Hutu peasants were killed by the Burundian Tutsi-controlled and dominated military. In any case, a very large number of Hutu-victims must be included in “the victims of the genocide” as these experts and the documentary show. However, in Rwanda such a suggestion is a crime that resulted in 2010 Rwandan Presidential candidate Victoire Ingabire being sentenced to 17 years in prison for asking where can “the memorials to Hutu victims” be found? The “Rwanda genocide” is now called the “Genocide against the Tutsi” and all Hutu are required to accept their collective guilt for crimes committed against the Tutsi, when in fact all could not have been involved. All of which give lie to the claim by the RPF government that “there are no ethnicities in Rwanda, anymore.” Ethnic discrimination is hardwired into Rwandan society through the mechanism of collective guilt and punishment. Some commentators have expressed amazement that, despite the shocking nature of these revelations there is very little that is “new” in the BBC documentary. Most of the sources and documentary evidence has been available for years and has been hiding in plain sight. Much of it can be found in the records of the UN Tribunal for Rwanda, although this database has been made virtually impenetrable for the untrained. The BBC has “broken the spell” of organized denial regarding the role of Paul Kagame and his U.S. and UK allies in sponsoring and covering-up their own role in the Rwanda genocide, and the resulting 20-years of massive human misery in central Africa. It’s time for other mainstream media to experience a similar awakening from quiescent slumber that permits monstrous crimes of U.S.-supported criminals to continue unchecked by public opinion, much less the rule of law. Erlinder is Director, International Humanitarian Law Institute, St. Paul, MN; past-President of the National Lawyers Guild, NY, NY; past-President of UN-ICTR Association des Avocats de la Defense, Arusha, Tanzania; Professor of Law (ret.) Wm. Mitchell College of Law, St. Paul, MN.